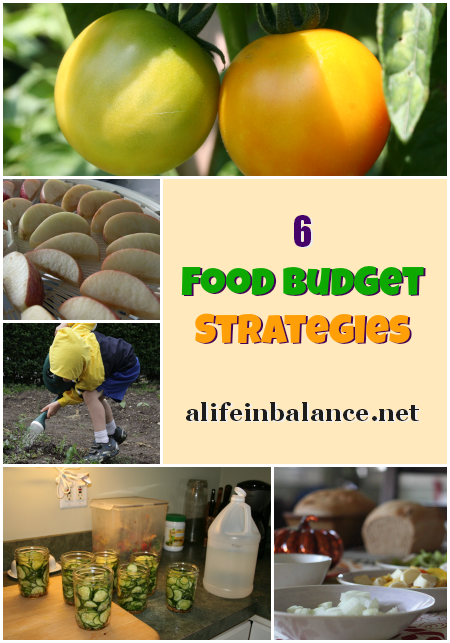 We use 6 food budget strategies to keep our spending low while providing wholesome nutritious food for our family of six. The food budget is one area where you can make changes that are often overlooked. It’s easy to fall into habits when it comes to food because of the emotional side of food. We’re a family of six, with two in cloth diapers. All of us eat whole foods in varying amounts with the baby nursing and eating whole foods. My weekly food budget includes food, toiletries, cleaning products, and eating out. I’ve spent several years implementing these food budget strategies. My first strategy, and one that takes time, is my price book. I can’t tell you how many people swear to me that a particular store has the lowest prices on cleaning products. I can pretty much guarantee that these people haven’t taken the time to track the prices and compare them at different stores. Writing the prices down gives a much more accurate picture. I don’t include the date of the price, something suggested in The Complete Tightwad Gazette , but I used to. My price book is a small, recycled notebook that I carry in my purse. I have items organized alphabetically with two pages devoted to each letter of the alphabet. My prices are broken down by the lowest common denominator, whether it’s price per pound, ounce or other. This makes it easier to compare prices when I’m in the grocery store or when I’m putting together the week’s grocery list based on what’s on sale. Looking at the weekly flyers to see what’s on sale is my next strategy. I’ve been shopping long enough that I shop for the pantry more often than I shop for what we need. Shopping for the pantry, i.e. stockpiling at the lowest price, keeps our overall food costs down. It also ensures that should something happen to my husband’s income, we have at least several months of food on hand. I’m not perfect and items do slip through the cracks, but more often than not, if we run out of something in the kitchen or bathroom, we can get it out of the pantry. When we are getting low on an item, it goes on the grocery list to be purchased when we’re able to. My next strategy is meal planning, specifically planning meals around cheaper items like potatoes, pasta, and rice. Potatoes usually run about $.30 to $.60 per pound, pasta the same and rice about .$30 per pound. Vegetables are also fairly cheap. If you start your meal planning with these items rather than meat and only serve the government-recommended portion of meat, meals can be cheaper and healthier. The government-recommended portion of meat is much smaller than most Americans eat. I think the image usually suggested is a portion that size of your palm, generally about 2 – 4 ounces. Ground beef, turkey, and chicken can also be stretched with bread crumbs, oatmeal and tvp, making for even cheaper, and healthier portions. When I shop, I go to a variety of stores. We go to BJ’s monthly since we’ve found that certain items like coffee and cheese are cheapest there. Sometimes if we need meat and meat hasn’t been on sale for awhile, we can find better deals on items like chicken thighs and beef. We generally spend about $100 at BJ’s. Every other week, we go to a produce place called Gentile’s for our fruits, veggies, and some of our dairy items. Hands down, Gentile’s has the best prices and best quality for fruits and veggies in our area. They also keep a shopping cart near the front of the store filled with reduce fruit and veggie bags, like 4 – 5 pounds of grapes for $1.98. We typically spend $40 to $50 every other week at Gentile’s. Another place I like to visit several times each month is a discount grocer called Price Rite. I’ve been to Sav-A-Lot and Aldi’s, but in our area, Price Rite has the greatest amount of items making it the best place for me to go. Since my husband likes to make sandwiches for work from cold cuts and rolls, we usually need to go to a regular grocery store weekly. Frequently we go to Shop Rite since they usually have the best sale prices, but sometimes we’ll go to Pathmark. This is where the price book can be a useful tool for determining the best use of our time. And finally, we have a fruit and vegetable garden from which we can and freeze produce. I highly recommended finding a copy of Jeff Ball’s book The Self-Sufficient Suburban Gardener . He organized his book around strategies for summer gardening moving into year-round gardening, all on an urban lawn. It can be done. We have a plot of about a quarter of an acre which runs around our house. On one side is our vegetable garden which runs the length of the property. It has 12 beds with four devoted to plum tomatoes (40 plants). We’re fortunate to have room for this, but a smaller yard can fit in a large amount of vegetables with some creativity. We also have two beds of raspberries, two apple trees, two currant bushes, strawberries in our flower beds and new this year blueberries, a cherry tree, cranberry bushes and a peach tree, some of which have survived the dry summer. When preserving produce, I freeze carrots, zucchini, broccoli and sometimes tomatoes in quart bags of mixed veggies using a steam canner. I grow pickling cucumbers for making relishes and pickles. I freeze and then can our plum tomatoes for making tomato sauce using a pressure canner. We also pick peaches and apples at a local orchard and use them for jams, butters and sauces, again using a steam canner. You’ll find my canning recipes on my Recipe page. This year we got a new dehydrator and used that for drying cherry tomatoes, peaches, plum tomatoes and cayenne peppers. These activities do take time which is why I spread my vegetable planting out over the summer, except for the tomatoes, to ensure that the harvest is generally manageable. I could depend more on the produce place for vegetables, but I want my family to eat as much organic produce as possible, and homegrown organic produce is the cheapest for us. When we eat out, we take advantage of a local grocery store’s cheap pizza deal. On Fridays and Saturdays, Genuardi’s offers $5 pizzas if you have their grocery card. Since we usually have a park day on Friday, we can pick up the pizza on the way home or my husband can pick it up for us. For our family, two pizzas gives us enough for dinner plus leftovers for the kids for lunch on Saturday. What are your food budget strategies? I have been poorly organized lately and one of the first places it shows in the food budget and what kind of meals we eat. Thanks for reminding me of some of the things I used to do to save money. We live in a rural area with few stores and no big chains like Aldis and Costco, but a price book still kept me on track by being able to determine when a sale price was really rock bottom. I also learned the pattern of when certain items went on sale. It was comforting to know we could live off the stockpile if need be. Now I’ve begun again to have extra meals in the freezer and plan meals for a month. It’s a real help. Diane Barnard recently posted..Finding Alternatives to Genetically Modified Food: What about Non GMO Soy & Corn? Diane, I’ve had the same struggle especially during November and December. Getting my dh involved in the meal planning has helped since he loves to cook. This first sentence caught me off guard, “with two in diapers”!! I then checked the date…an oldie, but goodie! Great tips. LOL – I know! I updated it a little, but left that piece.